I'm not sure how captionable this is, but for some reason the picture really freaked me out after I looked at it for long enough. 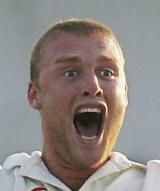 Flintoff prepares for his take on Penn and Teller's famous trick, catching a Brett Lee beamer with his teeth. Shahid Afridi's interpretation of Flintoff's request that he "reinsert" his off-stump on dismissal proved painful for the unexpecting bowler. A look in the rearview mirror was all it took for Adam Gilchrist to discover that some prankster had stuck the new "Andrew Flintoff Bobbling Head' to his back window. What are you doing down there, Geraint? Freddie thought his stint as a laughing clown at the ECB's charity fete was a real lark. He'd assumed he was supposed to give out prizes, but things seemed to work differently. Sure, the punters still stepped right up and inserted their balls, but after the down the chute part, he was given a free half-glass of scotch, and the punters seemed to walk away empty-handed. Freddie stared in horror as Shane continued "...it was a different time then. Your mother and I were young, we`d had a few drinks... just try to understand..."
Andrew Flintoff's reaction said it all when the winner of the "Travel with the English Cricket Team on Tour in India" competition was announced as "tooextracool, from Bangalore". Oh God, whats Kev (Pietersen) Done to his hair now?! "you mean Gougie actually won come dancing? next you'll be telling me Rob Key's been named Weight Watchers slimmer of the year! " How good a pair are Harmison and Flintoff ?